A fresh render of the forthcoming Nokia X6 has leaked and it looks as though it will join the ranks of Android smartphones rocking notched displays in 2018. Although purportedly a mid-range device, and not high-end as first thought, it does feature high-end bezel-less looks. 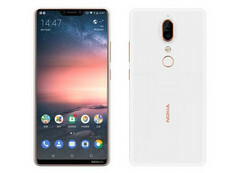 In fact, if the render is accurate, it looks as though the Nokia X6 will have among the thinner bottom bezels we’ve seen on an Android device with a notched display. The display is reported to be a 5.8-inch in size, the same as the iPhone X and the Samsung Galaxy S9, while it will feature the popular 19.9 aspect ratio. The rear of the device looks quite similar to the HMD-made Nokia 7 Plus, but this device is said set to sit between the Nokia 6 and 7 Plus in Nokia’s lineup. To this extent, it will be powered a by a mid-range MediaTek Helio P60 SoC and matched with 4 GB of RAM. Some markets may receive a variant fitted with Qualcomm’s mid-range Snapdragon 636 SoC and a more generous 6 GB of RAM. As with all of HMD’s devices released in 2018, it will be an Android One device and will thus run a stock version of Google’s Android 8.1 Oreo out of the box. It is expected to launch in China for the equivalent of just US$250 for the MediaTek variant, which could make it another hit in HMD’s all-new portfolio of Nokia-branded devices. Expect an official launch on April 27.